According to the findings of a recent study, the prevalence of obesity worldwide has risen from 105 million in 1975 to 641 million in the last 40 years and researchers predict that by 2025, 44% of Americans could be obese. Another study reports that 7 states have obesity rates among adults at or above 35 percent and yet another study reports that even child obesity rates are alarmingly high. What could be contributing to this obesity epidemic? Low fruit/veggies consumption. A recent CDC study found that 87% of Americans aren’t meeting the vegetable requirement and 75% aren’t meeting the fruit requirement. Most Americans eat only 1 serving of fruit and 1-2 servings of vegetables each day. However, the national recommendation is 1.5-2 cups of fruit plus 2-3 cups of vegetables per day. Lack of physical activity. One recent study showed that few children meet the national guidelines for physical activity–60 minutes of moderate to vigorous physical activity (MVPA) every day. Another study showed that home and school environments provide even less encouragement to be physically active for girls than boys. More than 60% of US adults do not engage in the recommended amount of activity (150 minutes of moderate-intensity aerobic activity like brisk walking plus 2 or more days of muscle-strengthening activities weekly) and approximately 25% are not active at all according to the CDC. Poverty. New research shows growing up in poor neighborhoods increases likelihood of obesity. Linked to a lack of exercise amenities and healthy food sources, and increased stress in low-income areas, living in poor areas puts young people at greatest risk for becoming or remaining obese in the future. Emotional eating. Children form unique relationships with food early in life, informed in part by the way they are fed and taught to use food. Some parents use certain foods as treats and rewards, like an ice cream sundae for an A on a test or a pizza party for winning a big game. As harmless as it may seem to offer certain foods, especially junk food, as a treat or as a way to soothe an upset child, studies show that parents could be unintentionally teaching their children to rely on food to deal with their emotions. To decrease current obesity levels and avoid an epidemic of severe obesity, new food policies and improved health care training must be implemented quickly. Activity equivalent calorie labeling is one policy recently introduced in the UK. Shirley Cramer, Chief Executive at the Royal Society of Public Health, says labeling food with the equivalent exercise to expend its calories would give consumers an immediate link between foods’ energy content and physical activity which might help people to change their eating behaviors, ultimately reducing obesity. Mindfulness-based eating awareness training (MBEAT) is another intervention that can be used to lower obesity. MBEAT aims to help adolescents combat obesity by raising their awareness of what they are eating and whether they are even hungry. Nevertheless, there are even simpler ways for adults and children alike to meet the national guidelines and increase their consumption of fruits and vegetables. Start at breakfast by incorporating fruit into your child’s meal. Add a banana to her cereal or toss some berries in his yogurt. Make vegetables the centerpiece of your meal instead of meat. When you serve your plate, fill it at least half full with fruits and vegetables. Think ahead. Before your kids leave for school in the morning, provide a healthy snack to take with them like an apple, orange or baggie of dried fruit (and pack one for yourself to bring to work as well). Consider making one meal per day (or at least one dinner per week) a large salad. If salads won’t work for dinner, pack a salad for your child’s lunch. If your child is on a free or reduced lunch program and it’s financially necessary for your child to eat a school lunch, pack a small salad or some raw veggies to supplement his lunch. A small bag of baby carrots or a stalk of celery from the grocery store won’t cost much but they can last your child up to a week of healthy snacking. This will go far in helping you and your family consume enough fresh produce. Whenever possible, serve your children water and sometimes non-fat milk instead of soda and juice. 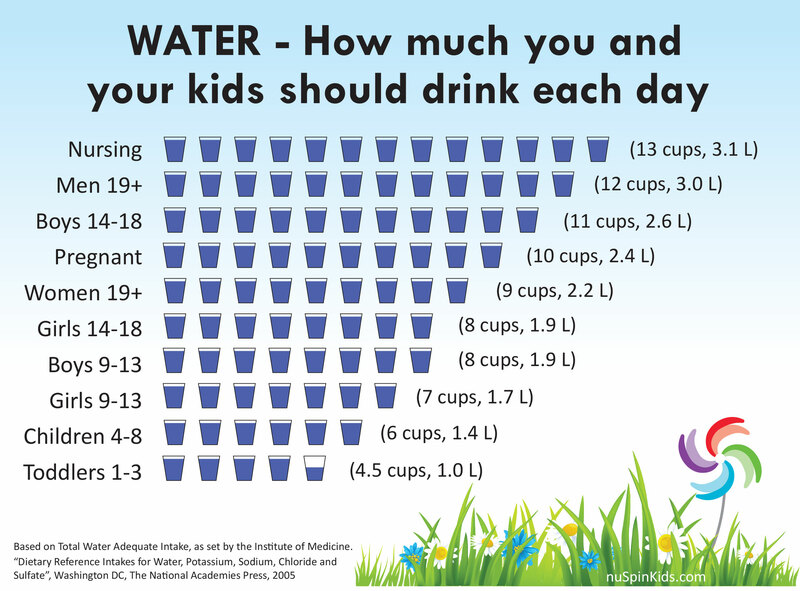 Click here for estimates on how much water you and your children should drink daily. Add chopped onions, carrots and celery or whichever vegetables you prefer when preparing soups, sauces, stews, beans or grains; and if a recipe calls for a certain amount of vegetables, double it. Most importantly, eat dinner together as a family as often as possible. If you can have breakfast together, do that as well. less likely to engage in disordered eating (weight control tactics: self-induced vomiting, laxative use, diet pills, fasting, eating very little food, using food substitutes, skipping meals, and smoking). improve family relations by increasing family communication and family connectedness. Though getting your family’s nutrition on the right track may seem daunting, remember that obesity is 100% preventable and that it’s never too late or too early to encourage healthful eating habits in your family.